Daniel Aguilar, 17, lives in Madison, Wisconsin, with his mother and younger sister; he has a cute girlfriend, Courtney; he plays in a band; is on the soccer team. He's about to change from your typical American teen. Dan's father is coming home, after six years in prison. Dan and his family are from Chile; it's 1986, and Marcelo Aguilar was a political prisoner in Chile. After six years of imprisonment and torture, he's coming home… Except it’s a home he's never been to, since Dan, his mother and sister left Chile for America years ago. While it's sometimes odd to think of "historical fiction" as being set just over twenty years ago, the political situation in Chile and America's involvement is history, particularly to today's teens that were born after General Pinochet's dictatorship ended. The author supplies a concise, matter of fact historical note about Chile's government from 1970 to 1990; along with a glossary and suggested further reading. You know how I love when authors do that! Dan and his family have to adjust to the return of Marcelo. Dan's childhood memories of a strong family man have been influenced by his father's reputation as hero and political prisoner. 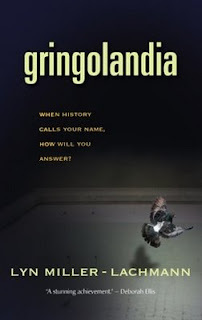 The reality is a man broken by torture and imprisonment, who bears little resemblance to either memory or propaganda, and who is a stranger to his children who are no longer children; who speak English; who have made a life for themselves in "Gringolandia." Adjusting to reality, trying to make a new normal, takes a backseat to the father's continued commitment to his country, Chile. The tension between loyalty to family and loyalty to country, as well as the price one is willing to pay for one's principles, is portrayed without being a cold lesson; it offers no answers, just this family's story. The message never overwhelms the story. The story is told by different people at different times; from Daniel waking in the middle of the night to the sounds of soldiers storming into his home to arrest his father, to Marcelo's time in prison, to both teenage Dan and his girlfriend Courtney telling their versions. It gives insight into what Marcelo endured; the conflicted view of how a son sees his father; and a girl who almost hero-worships the great political prisoner, Marcelo Aguilar. This is one I definitely want to read and share. I especially like how different perspectives on the theme are explored through individualized characters. Thanks for this review. I just got a review copy of this book and started reading it last night. I appreciate your review so much! It is difficult to read because of the trauma but so interesting - it has sucked me right in. Thank you so much for the review. I'll have to say it was a difficult book to write, and it took me 22 years to do it. I tried to put it aside numerous times, but the story - based on many true stories - wouldn't let me go. I now have a Teacher's Guide available on my web site, web.mac.com/lynml.